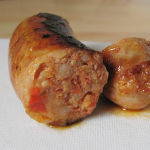 Jason Drage tells us that his father made sausages for many years before him and the combination of really good quality pork, with red pepper and chorizo according to his father do really make for a good sausage flavour. We would agree too having now tried them out on a few guests who were all in agreement that the Churchgate Red Pepper & Chorizo is a top sausage. Now in the cooking up (we pan fry as in all our sampling) yes they do leak a bit of dark oil in to the pan, from the chorizo no doubt, but this isn't an issue is it? Well we don't think so as it's this oil that's got flavour itself that the sausage sizzles in. The good quality natural skins tightened up and what was most noticeable was there was no shrinkage of the product. OK a little weight loss which you would expect in the cooking process as some moisture is cooked off and oil released from the chorizo. I will ask Jason though when I call in to the shop next, what sort of percentages in the mix is he using, as the balance between the pork and the chorizo was absolutely spot on as far as we were concerned. 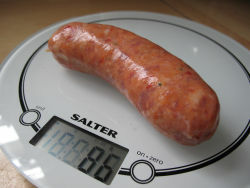 Not so much chorizo that the sausage becomes heavy and dense, but enough pork so that the sausage still retains fair texture with a good bite, and avoids being a heavy going to eat "sausage log"! Taste-wise we all agreed these particular sausages were bang on the money, with just enough red pepper flavour sweetness to please, and just enough chorizo flavouring to provide a warmth and tingle to the taste. 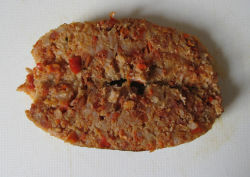 The texture of the cooked sausage was pleasing with a really good distribution of ingredients that can be easily seen from the photo below. Jason Drage of the Churchgate Sausage Company certainly knows his stuff when it comes to sausage making. This is THE flavour so far we've found in 2015 that you really must try. 105x30mm before cooking, 105x30mm after. 86g before cooking, 70g after. That's a shrinkage of 0% & weight loss of approx 18%.